What does Mike Ashley want with Rangers? The Sports Direct owner prepares to put his name on Rangers' Ibrox stadium deed, while a canny restructuring deal sees his USC clothing brand shake off insolvency. Standard. In a move that's unlikely to win him any Glaswegian philanthropy awards, Mike Ashley has offered Rangers football club a £10m loan to keep it afloat for a few more precious weeks. This act of generosity comes with only one, trifling catch - he wants the Ibrox stadium as security for the loan. Sports Direct filed its intent with the Register of Scotland on Tuesday to be put on the deeds for the Ibrox and for Rangers' training ground Murray Park, in a sign that Ashley is winning the battle for the beleagured club's soul. Rangers is in trouble. Like an accident victim relying on transfusions, it's been kept alive by a succession of share purchases and loans, the latter mostly from Ashley. The club's showing no signs yet of being able to survive by itself, only last week announcing to the stock exchange that it needed more external funding before the end of the month. In the midst of this crisis, which kicked off with the club entering adminisration and being demoted to Scotland's Third Division in 2012, Rangers has recently found itself caught between three powerful interests - Mike Ashley, American investor Robert Sarver, and an alliance between Dave King and a consortium known as the Three Bears. Sarver, a late arrival to the battle, offered £20m for the club, but withdrew last week after the club said he wouldn't be able to meet the requisite 75% shareholder approval for the deal to go ahead. Though Sarver has reserved the right to make another offer, this effectively leaves Ashley and the Three Bears, both of whom have offered loans to tide the club over. On Thursday, Rangers confirmed to the stock exchange that it's 'currently considering various proposals to secure the financial future of the club, however no decision has been made at this time'. The filing with the Register bodes well for Ashley, because it means Rangers' two biggest properties cannot be given as security to anybody else before February 17th, well after the club needs its next transfusion. According to the BBC, the Three Bears had offered a £6.5m loan, later to be converted to equity, in exchange for the right to appoint two board members and security over Murray Park. If they were to offer a loan now, however, it would effectively have to be unsecured. So what's Mike Ashley up to? If lending money to Rangers football club was a rational financial decision, banks would be involved, not billionaires. Sports Direct has already leant the club £3m, which is due to be repaid in April, and there's no prospect of interest. Along with its 8.3% stake, Sports Direct's main concern with Rangers is their merchandising joint venture, Rangers Retail, but this is unlikely to have motivated Ashley here either. His actions have enraged fans. Indeed, Rangers Supporters Trust went so far as to call the current loan offer 'legalised theft', and said 'we will not stand by and watch it happen'. Not exactly the response you want from your would-be customers. So he's not in it for interest on the loan or to boost Rangers Retail sales. 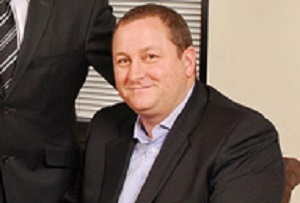 Could it be possible then that Ashley's eyes were on the Ibrox all along? Could we see Rangers' ancestral stadium turned into a very oval block of flats, or the world's largest, emptiest branch of Sports Direct? This too seems rather unlikely, unless Ashley knows something about Scottish planning permission procedures that we don't. You could fit a lot of sporting goods in the Ibrox stadium. The security over the stadium, and indeed the loan itself, have value to Ashley only as leverage. The Three Bears, King and the other anti-Ashley shareholders have sufficient voting power to force an EGM at the club, and it's quite possible they could wrestle control from the alliance between Ashley (two of whose associates -Derek Llambias and Barry Leach - are on the board) and Sandy Easdale. If the current, pro-Ashley board accepts his offer now, such a counter-coup would in many respects not matter. The club would still be beholden to Sports Direct, to the tune of £13m and the keys to its most valuable property assets. He would still have them very much by the title deeds. Even then, however, it's hard to see why Ashley is so concerned. The sums of money involved are, after all, relatively small compared to the vastness of his empire. Could it be that he simply doesn't like to lose? While all this has been happening out on the front, Sports Direct has had problems in the heartland. Its chain USC, which it bought in 2011, gave formal notice of its intention to file for insolvency on January 8th, at the instigation of its creditor Diesel. Despite Sports Direct's successes, its 'premium lifestyle' chains USC and Republic have struggled, with revenues falling 2.8% the six months to October 26th. It was surprising to learn, therefore, that USC was bought yesterday, by none other than its sister store Republic, thus saving the firm from the receivers. Essentially, this rather incestuous deal is a clever piece of corporate restructuring. Republic is presumably in a better position to shoulder the debt than USC, and the filing allowed time for the 'purchase' to go ahead without interference from any pesky creditors. As a result, according to Duff & Phelps, the insolvency specialists appointed to handle the insolvency procedings, all USC stores will now continue to trade, despite earlier concern many would have to close. Ashley really doesn't like to lose, does he?